Using "Bcc" When Sending eMails - Watch Out! I talked to a client earlier this week about using "Bcc" - "Blind Carbon Copy" when sending emails, and I thought this would be a good subject for a blog post. "Bcc" allows you to copy someone on an email without letting any of the other recipients know. It's a handy tool in some cases, but it's also worth knowing a bit more so you don't make mistakes. 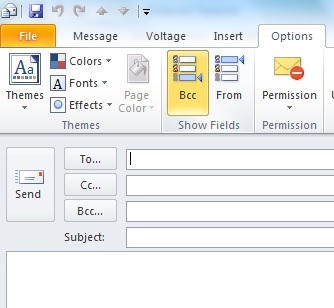 In order to make the Bcc field available in Microsoft Outlook 2010, in a new mail message select the "Options" tab and then select the Bcc under "Show Fields". This will make a Bcc field available to you. There are cases where you may want to "secretly" inform someone without everyone else knowing, but use caution when using Bcc. Here's an example: If you send messages to a group of people you may put one address in the To: field which would be the "main" recipient, and it may be appropriate to notify several others in using the Cc field. If anyone is in the Bcc field, none of the other recipients will know. If a "To" or "Cc" recipient selects "reply all", the Bcc recipients will not be exposed. However, if a Bcc recipient hits reply all, that user will expose themself (but not the other Bcc recipients), and this could be a problem in some cases - "Hey, why did that person get involved in this matter?". This is why we urge you to use caution when using Bcc. A safer approach may be to simply forward your sent message to the intended "Bcc" recipient, so if they reply, it only goes to you. The time you definitely should use Bcc is when you send a message to a group of people and it wouldn't be appropriate to divulge all their email addresses, as many people would take this as an invasion of their privacy. For example, if you send an email to a group of clients, put your own address in the "To" field, and put all the other addresses in the "Bcc" field. In Outlook, when you look at your "sent" messages in the preview panel, you won't see the Bcc field which may make you wonder if you sent it or not to the intended recipient. If you open the message, though, you will see the Bcc field. If you're using Ekaru webmail, if you open the "sent" message and select "More" then "View full header", you'll see the Bcc information in the pop-up. Some people refer to the Bcc field as "Blind Co-Conspirator", so think through how you want to use this feature.